Explore the stunning natural beauty of Poland's and Slovakia's landscape with its snow-covered mountains and beautiful towns. Experience a wide range of unusual winter activities including skifox, a type of bike on skis, riding in a snow cat vehicle, snow tubing on air-filled rings and night sledging as well as snowshoeing, ice skating and cross country skiing.... a real winter adventure. We check in to our hotel and have an orientation walk of the city. Dating from the 13th century, Krakow is a picture-postcard maze of narrow streets, grand buildings and al-fresco cafes. We visit Rynek Glowny, Europe's largest medieval square with its quirky town houses and historic buildings that surround the area including Sukiennice which is the most famous and still in use today as a covered market. We also explore the delightful Old Town; a UNESCO World Heritage Site and the only major Polish district to escape the war unscathed. Overlooking all this is the fairy-tale Wawel Castle, where past kings and queens are buried and is the home of many treasures that have been collected by the Polish monarchy. There is also the opportunity this evening to explore the former Jewish Kazimierz District, which was the Jewish Ghetto in World War II and the setting for the film Schindler's List. Nowadays this area is probably the most vibrant part of the city with unique cafes, bars and restaurants and it offers an interesting insight into how the Krakow Jews lived during the war years. We travel this morning crossing the border from Poland into Slovakia, a journey of around three hours. Our destination is Tatranska Lomnica in the High Tatras. This picturesque village is known for its skiing in winter and hiking and mountaineering in the summer and is located in the heart of the mountain range with stunning views of the Tatras Basin below. The Tatras Mountain range is strictly protected, and despite the area's popularity, the town still has many traditional wooden buildings and its alpine culture still strongly evident. On arrival, we'll enjoy a gentle walk around the town to get our bearings, before donning snowshoes for an introductory walk close to our hotel. The trails provide the opportunity to enjoy the tranquil splendour of mountain scenery and beech trees that are covered in layers of blanketing snow. Snowshoeing is fairly easily mastered and we should need just a few minutes to feel confident enough before heading off on our afternoon's exploration which should last around 2 ½ hours. Your Explore Leader will adjust the duration and distance to match the requirements of the group. Snowshoes and hiking poles are provided. Please note, the order of the itinerary may vary depending upon the weather conditions. Avalanche action awaits us today! We walk from our hotel to the railway station and take a short train ride to the neighbouring village of Stary Smokovec. From here its a few minutes walk to the funicular base station. We board the funicular and ascend to a high mountain village where many of the snow activities take place. From here we take a half hour's walk to Velka Studena dolina. During our walk, an unexpected event happens! We are challenged to find hidden objects under piles of snow - we receive a special device to search for the object as well as shovels and detectors. We all have to work together as a team to discover what lies beneath! Hot refreshments are provided. The afternoon is free for optional activities including skiing and snowboarding back in the Tatranska Lomnica area which has a range of slopes available to suit the beginner or intermediate skier. The Tatranská Lomnica ski region located in the High Tatras, the highest in Slovakia, offers 12km of slopes and 8 ski lifts (mixture of modern chairlifts and cable cars) to an elevation of 2,196 meters; ideal for full or half day of skiing. This morning we drive to Cerveny Klastor on the Slovakia/Polish border where we try out cross country skiing by the beautiful Dunajec River running through the Pieniny Mountains. The area has some of the most interesting geological structures and ecosystems in the country. The group may be divided according to physical ability with the option to travel along a 2-4km pathway or continue with a local guide to Lesnica, which extends the distance to 9 km in total. The whole group reunite and meet at Lesnica for a typical Slovak lunch before driving back to Tatranska Lomnica. There is time to relax for a few hours back at the hotel before venturing out for our night sledging activity. We take the funicular train up the mountain to reach the start of the 2.6km sledge track which leads from Hrebienok down the mountain to Tatranska Lomnica. The route is flood lit and its a race to the bottom! We spend the morning ice skating on a large frozen lake and this afternoon is left free to enjoy the skiing in the area or alternatively relax in the wellness centre of a local hotel. This evening a real treat awaits us. We travel the short distance by train to the bottom of the ski slopes and b0ard a snowcat. Sitting in a small compartment behind the driver, the enormous ski tracks carry us high into the mountains to our restaurant located at the altitude of 1173m. Here we we enjoy a five course gourmet dinner. The evening ends with the snow cat ride back down to Tatranska Lomnica. Today we try out a range of activities that are lots of fun. First, snowtubing - these are fast inflatable tubes that you sit on and enjoy the ride back down the ski slope. All you have to do is sit into a rubber wheel, tie yourself to a ski-tow, let yourself be pulled a few meters upwards and slide downhill. No experience is necessary and you enjoy five rides. 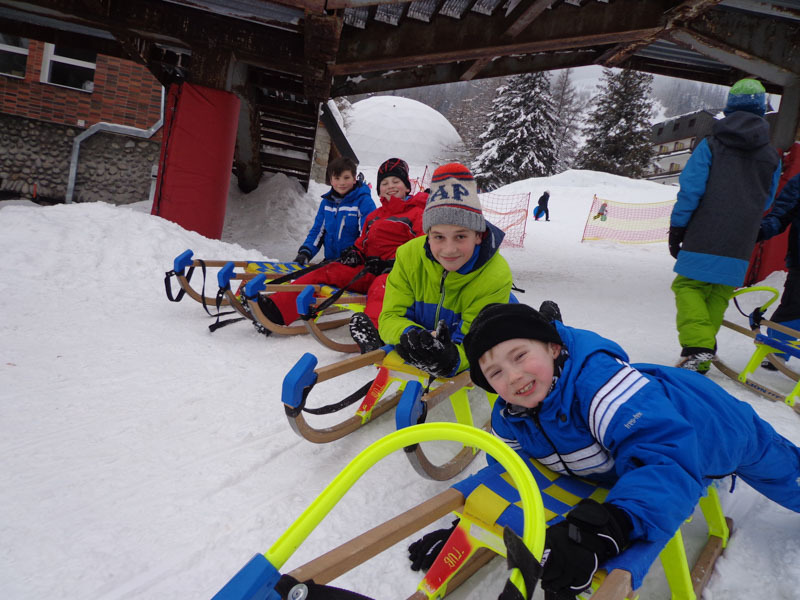 We then try Funtools which is like a bicycle with mini skis instead of wheels that you sit on to manoeuvre along the snow - a perfect activity for non-skiers. Later this afternoon we walk to our cooking class which takes place in one of the local hotels. We learn how to cook a selection of traditional Slovakian dishes. This involves all the family as we split into groups to prepare a starter, main and dessert. We then sit down and enjoy our creations at the end of the class. After breakfast we drive back to Krakow where we have the afternoon free to enjoy this city further. Trip ends after breakfast when we transfer to the airport. Day 3 / 5: Afternoon skiing. The Tatranská Lomnica ski region located in the High Tatras, the highest in Slovakia, offers 12km of slopes and 8 ski lifts (mixture of modern chairlifts and cable cars) to an elevation of 2,196 meters; ideal for full or half day of skiing. Day 3 / 5: Lomnicky peak cable car. For the ultimate view in the Tatras take a cable to reach the majestic Lomnicky peak at 2,634 meters. Early booking is essential - visit https://www.vt.sk/en/activities/cableway-trips/lomnicky-peak/ to book your ticket. Hotel Titris wellness centre. 1 hour €6.60, 2 hours €10, 3 hours €12.80 discounts available for children and family tickets. Day 7: Visit the nearby salt mine known for its magnificent 3 kilometres of meandering corridors and chambers chiselled out in rock salt, underground saline lakes and statues sculpted in salt. Adult PLN79 per person, child PLN64 per person. Pack for cold mountain conditions. It's best to dress in warm layers of breathable fabrics. You'll need waterproofs and plenty of warm clothing including a warm waterproof jacket, jumper, fleece, gaiters, gloves, hat, scarf and thermal underwear. Warm waterproof walking boots with a good tread and ankle support are required. Trainers for relaxing in the hotel. One main piece of baggage and a daypack for personal items. Bring a water bottle, camera, sunglasses and suncream. Although entirely voluntary, tipping is a recognised part of life in this region of the world. At your discretion you might consider tipping your Explore Leader in appreciation of the efficiency and service you receive. For this we suggest €10 per family member. The hotel is situated in the centre of Tatranska Lomnica, near to the ski slopes and at the foot of Lomnicky Peak, the second-highest point in the High Tatra Mountains. All the en-suite rooms are comfortably furnished with most having balconies with views of the mountains of the High Tatras or Tatranska Lomnica, there are a limited number of interconnecting family rooms. There is also a restaurant and cafe which has free Wi-Fi access. The resort also has a host of restaurants with great variety and choice for children as well as adults. An ability to swim is preferably for your safe enjoyment of the water based activities on this trip. If you wish to participate in these activities then we advise that you are able to swim. Family winter adventure holiday: For the majority of families, if you mention a winter snow holiday you think of finely groomed piste in a ski resort. For those families new to skiing or those looking for a taster of skiing with plenty of other activities to keep the family entertained, our winter family holiday in Slovakia is ideal. The winter months offer an activity playground for families and we have so many experiences to share. Ride in a snow cat up the mountain to enjoy a four course dinner in style, try out a ski fox, take up the avalanche action challenge finding a hidden object under piles of snow, experience a Slovenian traditional cookery class and try cross country skiing in the wilderness, there really is something for everyone, with the added bonus of the chance to try out skiing or snowboarding! Triple Rooms: This trip allows the option for triple rooms to be included within your booking both in Krakow and Tatranska Lomnica, Slovakia. Our hotel in Slovakia also has a limited number of interconnecting rooms. If you would like this option please ask our Sales team for further information. Average Age: As a guide we have identified the actual average age of the children who have travelled on this trip over the last 5 years, to help you decide whether it's the right one for your family. The average age on this trip is 12 years old; this trip is suitable for children of all ages. This adventure is designed for families wanting a varied and unusual winter holiday which allows some time for skiing. There are numerous included activities within the itinerary and many experiences that you would not necessarily find in other ski destinations. Try out funtools, a type of bike on skis and ride in a snow cat vehicle; plus discover the dramatic scenery as we snowshoe, ice skate and cross country ski through the winter landscape of Slovakia and also include a tour of the beautiful Krakow in Poland.